Hosta ‘Krossa Regal’ is one of the classics, and it is an impressive sight with its large, vase-shaped mound that makes a wonderful backdrop for smaller hostas. This hosta has thick, naturally slug-resistant, frosty blue leaves that become a slightly deeper blue as the season progresses. I have had one of my Krossa Regal hostas for several years, and by last summer it had become much too large for the space it was growing in. It had also become much too heavy to move in one piece, so I reluctantly divided it… and now I have at least three smaller but still quite large Krossa Regal hostas in each of my gardens. All of these came from this one plant. 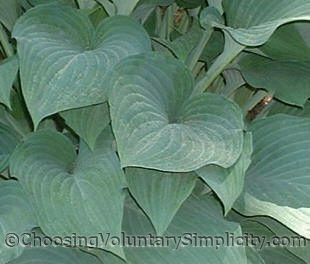 Krossa Regal is one of the sterile hostas, so it does not produce seed pods. As soon as it finishes blooming, I always cut the flowers off, leaving a few inches of scape behind to serve as a location marker for next spring. Like a few other hostas, Krossa Regal will sometimes turn an orangey-gold color in the fall, although this has never happened to any of the hostas in my gardens. I think perhaps our summer temperatures are too cool? Jane, there are so many vase-shaped hostas. 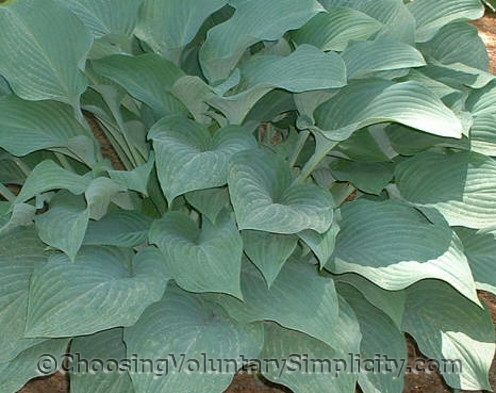 I would suggest looking at the photographs and descriptions on some of the hosta retail sites. 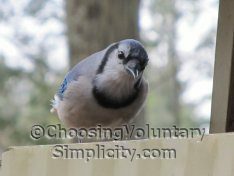 Hopefully you will find the hosta you are trying to identify. I can’t tell you how happy I am to have found someone who obviously enjoys hostas the way I do mine. I don’t have very many yet but I am trying to learn all I can and I am finding your photographs and information most helpful. Glad to have found a Hosta expert who has such splendid plants and takes such wonderful photographs.